The use of membrane structures for roofs, biogas containment and permanent structures in the waste water industry is becoming increasingly common. 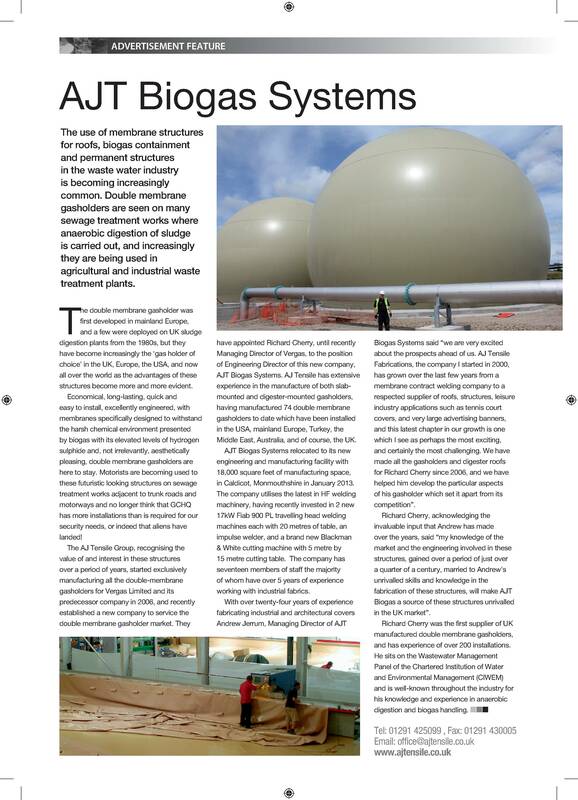 Double membrane gasholders are seen on many sewage treatment works where anaerobic digestion of sludge is carried out, and are being increasingly used in agricultural and industrial waste treatment plants. The double membrane gasholder was first developed in mainland Europe, and a few were deployed on UK sludge digestion plants from the 1980s, but they have become increasingly the ‘gas holder of choice’ in the UK, Europe, the USA, and now all over the world as the advantages of these structures become more and more evident. Economical, long-lasting, quick and easy to install, excellently engineered, with membranes specifically designed to withstand the harsh chemical environment presented by biogas with its elevated levels of hydrogen sulphide and, not irrelevantly, aesthetically pleasing, double membrane gasholders are here to stay. Motorists are becoming used to these futuristic looking structures on sewage treatment works adjacent to trunk roads and motorways and no longer think that GCHQ has more installations than is required for our security needs, or indeed that aliens have landed! The AJ Tensile Group, recognising the value and interest in these structures over a period of years, started exclusively manufacturing all the double-membrane gasholders for Vergas Limited and its predecessor company in 2006, and recently established a new company to directly service the double membrane gasholder market. They have appointed Richard Cherry, until recently Managing Director of Vergas, to the position of Engineering Director of this new company, AJT Biogas Systems. AJ Tensile has extensive experience in the manufacture of both slab- mounted and digester-mounted gasholders, having manufactured 74 double membrane gasholders to date which have been installed in the USA, mainland Europe, Turkey, the Middle East, Australia, and of course, the UK. AJT Biogas Systems relocated to its new engineering and manufacturing facility with 18,000 square feet of manufacturing space, in Caldicot, Monmouthshire in January 2013. The company utilises the latest in HF welding machinery, having recently invested in 2 new 17kW Fiab 900 PL travelling head welding machines each with 20 metres of table, an impulse welder, and a brand new Blackman & White cutting machine with 5 metre by 15 metre cutting table. The company has seventeen members of staff, the majority of whom have over 5 years of experience working with industrial fabrics. With over twenty-four years of experience fabricating industrial and architectural covers Andrew Jerrum, Managing Director of AJT Biogas Systems said “We are very excited about the prospects ahead of us. AJ Tensile Fabrications, the company I started in 2000, has grown over the last few years from a membrane contract welding company to a respected supplier of roofs, structures, leisure industry applications such as tennis court covers, and very large advertising banners, and this latest chapter in our growth is one which I see as perhaps the most exciting, and certainly the most challenging. We have made all the gasholders and digester roofs for Richard Cherry since 2006, and we have helped him develop the particular aspects of his gasholder which set it apart from its competition”. Richard Cherry, acknowledging the invaluable input that Andrew has made over the years, said “my knowledge of the market and the engineering involved in these structures, gained over a period of just over a quarter of a century, married to Andrew’s unrivalled skills and knowledge in the fabrication of these structures, will make AJT Biogas a source of these structures unrivalled in the UK market”. Richard was the first supplier of UK manufactured double membrane gasholders, and has experience of over 200 installations. He sits on the Wastewater Management Panel of the Chartered Institution of Water and Environmental Management (CIWEM) and is well known and well respected throughout the industry for his knowledge and experience in anaerobic digestion and biogas handling.